Entering a property that does not belong to you, either intentionally or accidentally, is trespassing and you are liable for any damages that result. In Kentucky, trespassing is most prevalent during hunting seasons. Hunting on property without permission is a serious violation. The Kentucky Department of Fish & Wildlife Resources recommends that "if you're not absolutely sure you have permission to be where you are, go back to a place you are sure about." The Department also states that a hunter must obtain permission before entering a private property to retrieve an animal. The state has several trespassing laws and protections for land owners. Timber Trespass is the common term for actions that are actually trespassing and theft. Timber Trespass occurs when an individual knowingly or accidentally enters private property, cuts and removes timber. If you trespasses on property owned by another to cut or order another to cut timber for your own use, you must pay the land owner "three times the stumpage value of the timber, three times the cost of any damage to the property, and all legal costs the land owner incurs" pursuant to the trespass. Under Kentucky law, any individual who knowingly enters a building and remains when he is not legally permitted or invited to do so is guilty of criminal trespass. It is also illegal to enter and remain on land protected by a fence or when a trespassing notice is posted on a sign that warns against trespassing. 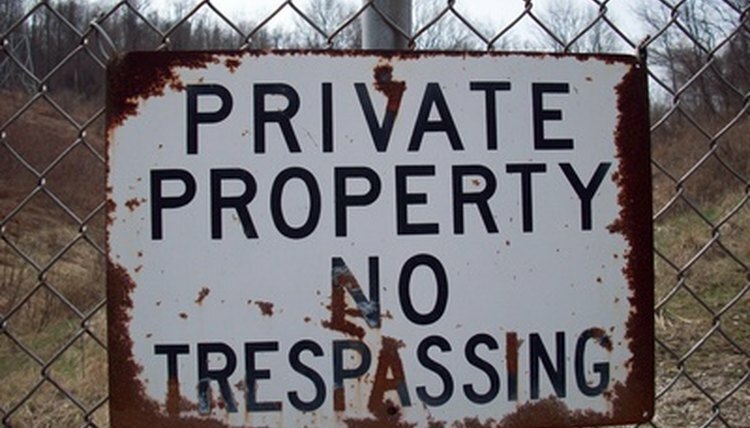 Criminal trespassing is a Class B misdemeanor. Illegally entering and remaining in a dwelling is a first degree Class A misdemeanor. A land owner cannot be held liable for any injuries a trespasser sustains while on the real estate unlawfully. If the owner or an individual acting on his behalf intentionally inflicts injuries on a trespasser, the land owner can be held liable. If a division fence is established by an agreement, each party is responsible to maintain his portion of the fence line. If a land owner fails to maintain his portion of the fence, he is liable for all damages sustained to the grass, trees, grain, cattle, crops or land of the other party as a consequence of trespassing cattle. A lien is placed on the cattle to ensure the party at fault makes reparations. When a civil suit is filed by a land owner seeking damages caused pursuant to a trespass, a jury may award joint and several damages against two or more defendants. Joint and several damages may be collected in full from one defendant or various amounts from different defendants until the judgment is satisfied. The University of Kentucky College of Agriculture: Timber Theft and Trespass; Jeff Stringer, Ph.D.
UK College of Agriculture: Timber Trespass in Kentucky; Jeff Stringer, Ph.D.
Shari Caudill began writing professionally in 1985 with the "Portsmouth Daily Times." Her work has also been published in the "Community Common" and "Cleveland Plain Dealer." Caudill has a writing certificate from the Institute of Children's Literature and a photography certificate from the New York Institute of Photography. Caudill, Shari. "Kentucky Trespassing Law." , https://legalbeagle.com/6552760-kentucky-trespassing-law.html. Accessed 26 April 2019.